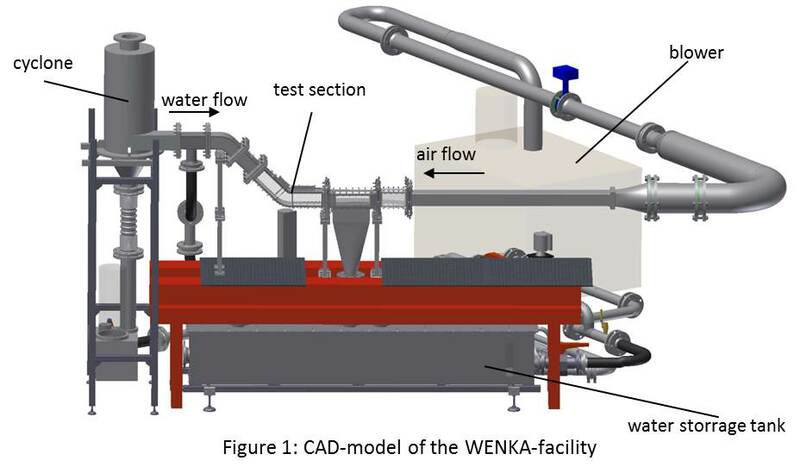 The WENKA experiment serves the investigation of counter-current stratified two-phase flows. From 2001 to today, several experiments were carried out on horizontal and bent channels. The construction concept of the duct is modular, the geometry can be changed easily. Figure 1 shows the CAD-model of the current configuration. Channel size and experimental parameters can be found in table 1. The objective was and still is the provision of validation data for new 2D and 3D CFD codes. For validation of turbulence- and phase-interaction models local high-resolution data is required. Therefore, velocity- and phase-distributions can be measured in several flow regimes. Movie 2 gives an impression of the complex flow phenomena in counter-current stratified two-phase flows. Since the beginning of the test operation, several graduate students and student workers studied stratified flow phenomena at the WENKA facility. Numerous articles and theses were published by different authors. Subsequently, a selection several publications of can be found. For more information or experimental data, please contact one of the contact persons named above.